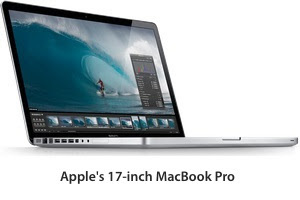 "There's no point in going as in-depth on this model of MacBook Pro as we did on the 15-inch version. In terms of hardware, build quality, and general patchwork inside, this is the same computer (albeit somewhat more gigantic). The same unibody construction is used here, and Apple calls the laptop the 'world's thinnest and lightest 17-inch notebook.' We won't argue -- it compares favorably to the smaller entry in the family, and besides it's obviously larger footprint, we didn't feel it was excessively heavy for a device of this size (it actually weighs 6.6 pounds, just a little over a pound heavier than the 15-inch version)," Joshua Topolsky reports for Engadget. "The version we received was the fully kitted out iteration of the laptop. The base configuration (a not-super-cheap $2,799) is outfitted with a 2.66GHz CPU, 4GB of RAM, a 320GB hard drive, and the switchable NVIDIA GeForce 9400M / 9600M GT GPUs. The version we have came fully loaded with a 2.93GHz CPU, 8GB of RAM, a 256GB SSD, and (yes) an anti-glare display. Needless to say, performance wasn't much of an issue -- but the final cost ($4,899) might be a little extreme for most," Topolsky reports. "Performance on our system was insanely fast... The new display is stunning. Not only is the thing massive in terms of resolution, but the color depth and contrast are stunning. Apple seems to have really honed the art of light sensing, and we found the display accurately adjusting itself to a room's light. When cranked up to full brightness, the screen beams -- it's crisp, clear, and colors pop," Topolsky reports. "The new [built-in] battery bests the typical lifespan of a MacBook Pro removable by almost double... the huge stretches of time between charges we saw on the new 17-incher are extremely encouraging, and likely long enough to make the system viable for field use," Topolsky reports.